Now, we invite you to kick off your shoes, stay awhile, and watch those revenue returns roll in. But if you’re not ready to sit down yet (it’s okay--we’re excited, too! ), and would like to take action to maximize your chances of dominating the Messenger platform, then this article is for you. The Messenger world is a new and exciting place. But if you dropped in for a visit without a compass, don’t worry--your Dashboard is here. 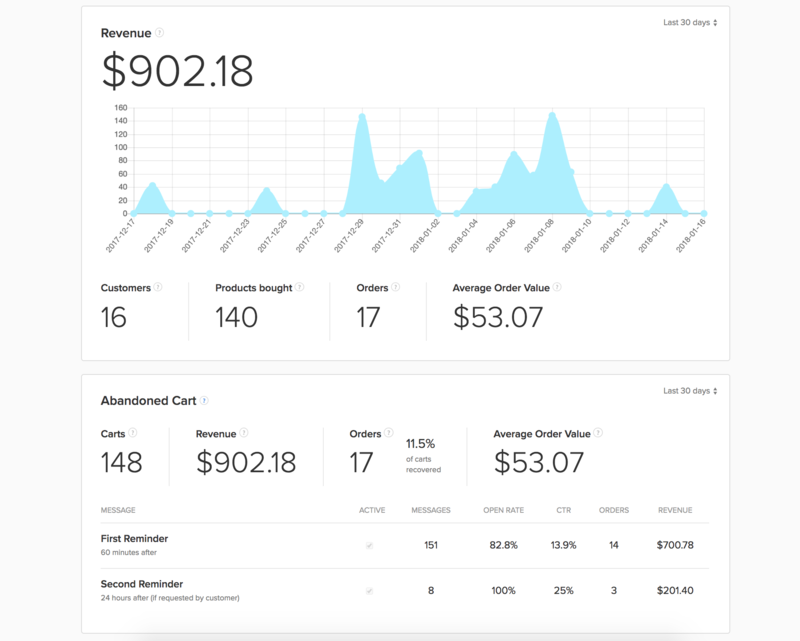 Once your store has fully completed setup and is connected to Octane AI, your abandoned cart, receipt, and shipping notifications will begin to send out to your customers. The Usage tab exists because not everyone who interacts with your bot is a customer who found you on your site after abandoning a cart. Some folks may interact with your bot by finding it on Facebook, or via a direct shared link to your bot. To view the types of interactions non-customers and customers alike are having with you on Messenger (interactions that don’t immediately recover revenue), open up the Usage tab. 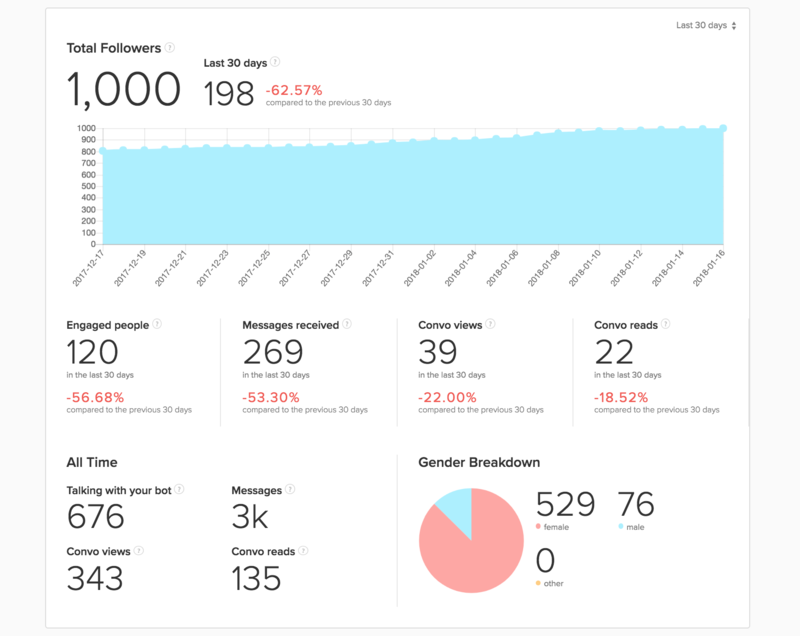 And for an in-depth look at all of your Dashboard’s stats, read this. Chances are, if you’ve joined Octane AI for Shopify, then your purpose in being here is to provide your customers with a concierge experience on Messenger. Our abandoned cart, receipt, and shipping notifications are the core of that concierge experience, but they’re also just the tip of the iceberg. If your purpose in joining Octane AI was also to establish your brand on Facebook Messenger, connect with your customers in the digital spaces they’re frequenting, respond to your customers through the channels they’re using, market to a wider base, and provide a scalable and immediate customer service solution, then keep reading! Your purpose is big and wide and we’ve got just the right tools to help you achieve it. Now that you know exactly what you want to accomplish on Messenger and why, it’s time to pick the tools best equipped to help you get to your goals and beyond. Read this for instructions on customizing your Get started Message. The Main Menu is a directory for all your bot’s active features. Your customers and Messenger followers can access your bot’s Main Menu at any time by clicking the hamburger icon at the bottom of their screen. This is a great place to highlight your most valuable content and important calls-to-action. It’s also the place where followers can locate and update their notification preferences. Take a moment to ensure the Main Menu is written in your brand’s voice, and includes all relevant links to your most engaging content. If you’re eager to connect with your new Messenger followers right away, Broadcasts are the way to go. Broadcasts are one-time messages you send out to your followers, either immediately or at a later scheduled time. Your Broadcast will show up on your followers’ phones as a push notification, so it’s a very powerful way to update your customers on sales, new arrivals, store events, and more. Read this for instructions on sending your first Broadcast. Read this for tips on optimizing your Broadcast messages. Bots are bot-tastic and all, but some brands find it important to also provide an option for Messenger followers to connect with a human if need be. The Messages feature allows your audience to send in typed messages to you, which you can access at any time from your Inbox within Octane AI. You can also receive email notifications anytime someone sends in a typed message, if you like. Take a moment to decide if you will want to use the Messages feature, or direct users to a customer service email or phone number instead. Read this for instructions on customizing your Smart Responses. Read this on why it’s important. The building block of every Messenger interaction is a Convo. A Convo is a button-guided, call-and-response conversation that you write anytime you’d like to share information with a customer on Messenger. Convos will form the basis of your Broadcast announcements (should you choose to start push-notifying your peeps), so the best time to start learning how to use them is N-O-W.
Read this for instructions on writing your first Convo.